During the latter part of 2004 and beginning of 2005, Macarthy and Stone were building on the former site of the Swindon Woodworking company, behind London Street, adjacent to Swan Lane. 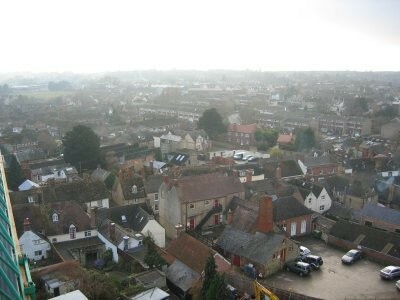 These pictures of the town were taken by Hilary Taylor from the tower crane used on the site.. The Folly tower is visible on the right, the line of yew trees in the distance are situated along the side of the Stanford Rd., and the Old Police Station, Coach Lane is visible in the foreground, on the left hand side. In the middle distance is the upper part of London Street, Ferndale St. with parts of Windy Ridge, Lansdown Rd, Berners Way, Tuckers Rd. and Nursery View are barely visible in the distance. London Street and its back gardens is the main street visible, with Ferndale Street (formerly known as Back Street) behind, with Lansdown Road on the right hand side. The white house prominent on the left of the picture is on the corner of Stanford Rd. and London St. The large 'T'shaped building in the middle distance is Brackendale, a block of sheltered flats for the elderly. This replaced the old workhouse building which dominated Ferndale Street up until the 1960s. London Street dominates in the foreground. The building immediately to the left of the crane used to be the Bull pub, now a private dwelling. Lansdown Rd is in the centre of the picture, with Brackendale to the left and Ferndale Street to the right. 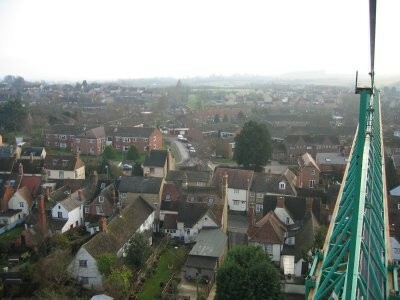 In the middle distance are Unton's Place and Pye Street, and Berners Way Estate is in the further distance. London Street, Ferndale Street, Untons Place, Pye Street, and Berners Way all feature here. 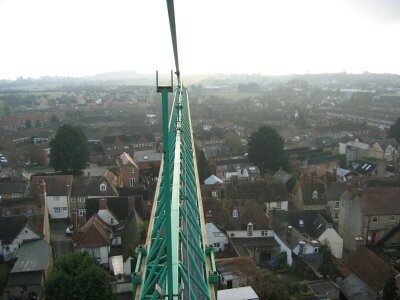 To the right of the crane tip is the Community College and Tucker Park, on the extreme right of the picture you can see Westbrook, with Marlborough Gardens in the distance. In the foreground the edge of Davis DIY, London street is visible. Davis DIY is in the centre foreground of this picture, with the Lees, Portway, and Westbrook on the right middle distance. To the left and right of Davis's is London Street, the lower end leading into the Market Place. The building with the 'serrated' roof right of the large tree is to the rear of the antiques shop (Aston Pine), and is on Ferndale Street. 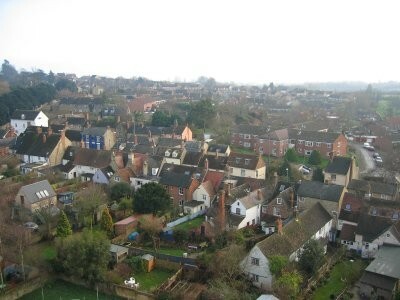 With the rear of Davis's on the left, Swan Lane can be seen snaking round the lower edge of the picture. 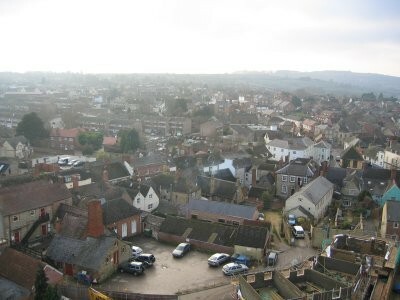 The Lees, Portway, and Westbrook can still be seen in the middle distance, with Marlborough Street leading diagonally from the right side of the picture. 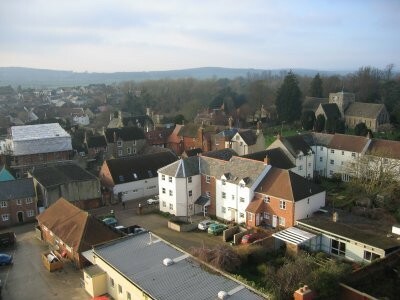 The top of the Old Town Hall is on the right of the picture, as can the Corn Exchange and Cornmarket. 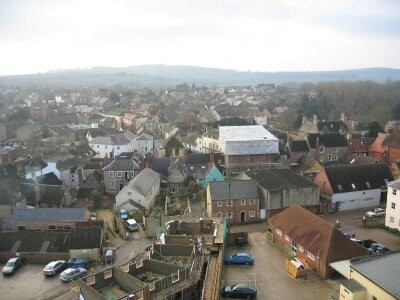 In the right middle distance there are the rear of shops in the Market Place, Lloyd's Bank being fairly prominent, and the Market Restaurant is on the right hand edge with the green rear wall. The building at right angles to these is to the rear of what used to be Liddiard's, the grocer, now the Tourist Office. It was once hoped that this building could house a Faringdon museum, but it has now been redeveloped and has become a private dwelling. The buildings under construction at the lower edge of the picture are low cost homes. To the right of these you can see the Royal Mail sorting office, and on the extreme right hand edge, Eastfield Court retirement flats are just visible. Barclays Bank, and the imposing, if smaller, town house better known as the local chemist can be seen in the town centre, with Cornmarket, the Corn Exchange, Marlborough Street and Gloucester Street just discernable beyond. In the centre - the Old Town Hall, flanked by the Crown Hotel (right), Barclays and the Chemist, (left), and a rear view of Market Place. This is dominated by the Pump House, now shrouded in plastic, undergoing a long awaited and costly repair and refurbishment. The ugly concrete building to the rear of the Pump House is the ill fated theatre, now closed. Further along the Market place is the roofline of Camden House, its chimneys rising above the other buildings. This once housed the District Council offices when Faringdon was the hub of the local rural district. With the Pump House on the left, the rest of the Market Place can now be seen. Camden House, Church House, the (former) Vicarage all lead towards the Church on the far side of Market Place, while the remaining buildings on the near side progress towards what used to be the Salutation Inn, now redeveloped as a mixture of private flats and an alternative therapy centre. Turning right along Church street the block of buildings culminates in another 'old vicarage', now private flats, at the juction of Swan Lane and Church Street. Eastfield Court, a complex of retirement homes, borders the eastern side of Swan lane. Beyond Eastfield Court can be seen the Church of All Saints, the parish church of Great Faringdon, parts of which date back to the twelfth century. 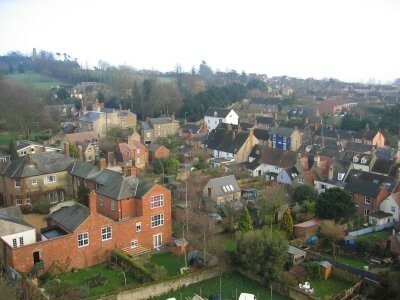 There is a secluded modern bungalow in the right lower foreground, with the mail sorting office at the lower centre.